Ok, so this is a little outside your control, but a hot dry summer is your best friend! Snails like the damp and will stay hidden during hot weather. It’s also worth remembering that when watering the garden to try and just water the roots of the plants and not make the whole area damp – otherwise the snails think it’s been raining and come out to make merry! 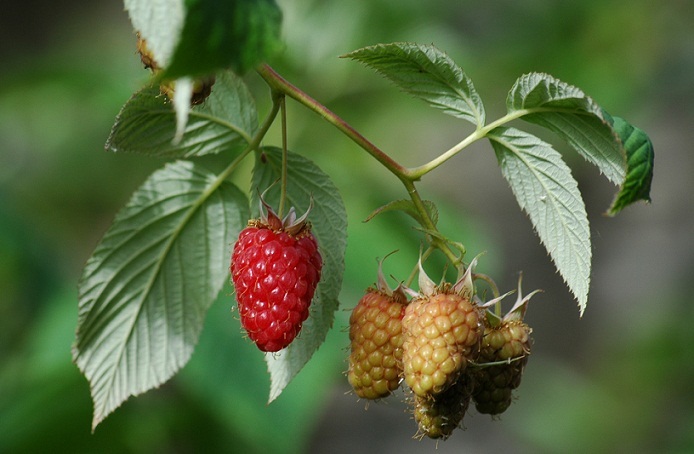 A process of trial and error has taught us that snails don’t eat raspberries, rhubarb, tomatoes, mint or marjoram. They only nibble at broad beans and usually the plants will survive. This may seem limiting, but we only have a tiny garden, so only growing a few varieties actually means we get a good crop. broad beans and raspberries - not a snail's favourite food! Theoretically, snails and slugs won’t cross copper tape because it gives them an electric shock. I have found this works, although again, it works much better in dry weather as they seem able to cross the tape when it’s wet. And you have to keep the tape clean and make sure that there aren’t leaves or twigs which provide a ‘bridge’ past the tape. I use pots with a line of copper tape wrapped around and have been able to use this to grow lettuces – something impossible otherwise! Height also seems to deter the little menaces and rocket grown in wall-hanging pot has never had so much as a nibble! This works with the broad beans: Get an empty food tin, cut the bottom off as well as the top, wrap copper tape around one end, and place it around the new seedlings, burying the tin about an inch. 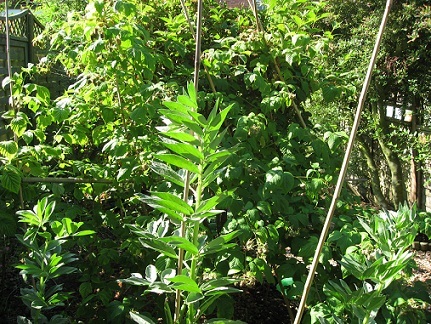 This should give the young plants enough time to establish themselves and get strong enough to resist losing the odd leaf. I’ve also seen plastic bottles used with the bottoms cut off, and growing seedlings safely inside can also work. 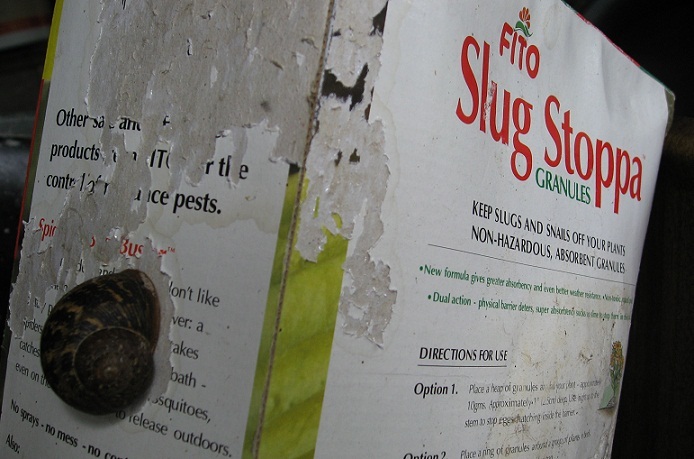 When snails and slugs do get onto your plants or into your pots, you’re going to have to remove them. I go out night and morning with a pair of gardening gloves and pick them off, then put them either on the compost heap or amongst some shrubs, where they should be kept busy for a few hours at least. On the whole, I would say that working with nature is always better than fighting against it. I’m sure I’ll keep trying new things – new plants to grow and new ways of keeping of the critters. But it’s the things that grow easily that seem to give the most pleasure and enable me to feel relaxed and peaceful in the garden, which is more to the point for me than beating the snails. Great read and so relevant as another annual round of trying to stay one step ahead of the slimey saboteurs starts again in the garden. I too have tried everything…eggshells, added height, but will get some copper tape next time I am out. I recently wrote a poem called Doilified on my Blog setting out my strategies and feelings on the topic! Like you I have no desire to kill anything in the garden. The garden is not mine to control, I merely caretake it. I like to see all of nature sharing the garden, pond, wood piles, trees etc with me. I had to laugh at your comment…slugs and snails not having learnt the art of sharing yet…Grrrrrrrrrr. Enjoying this Site immensely. Thank you! It’s so hard not to get annoyed by them isn’t it? Like you I want my gardening to be a relaxing experience in tune with nature, so I try and smile at their antics through gritted teeth! Loved your poem, so true! Ah thank you so much…I anticipated that we shared this common angle on slimey saboteurs…mmmm I try and smile too…and the year is but beginning! I wish you fortitude in all your endeavours too…good luck!